On Tuesday, I judged a flight of beers for the Dixie Cup, the annual competition held by Houston’s Foam Rangers homebrew club. The style of beer was cream ale. Judging cream ale, and tasting several different twists on it, gave me a few insights into brewing the style — especially if you are brewing it to enter into a BJCP homebrew competition. Cream ale is a straw colored ale that is similar to an American Pilsner, but slightly more flavorful. 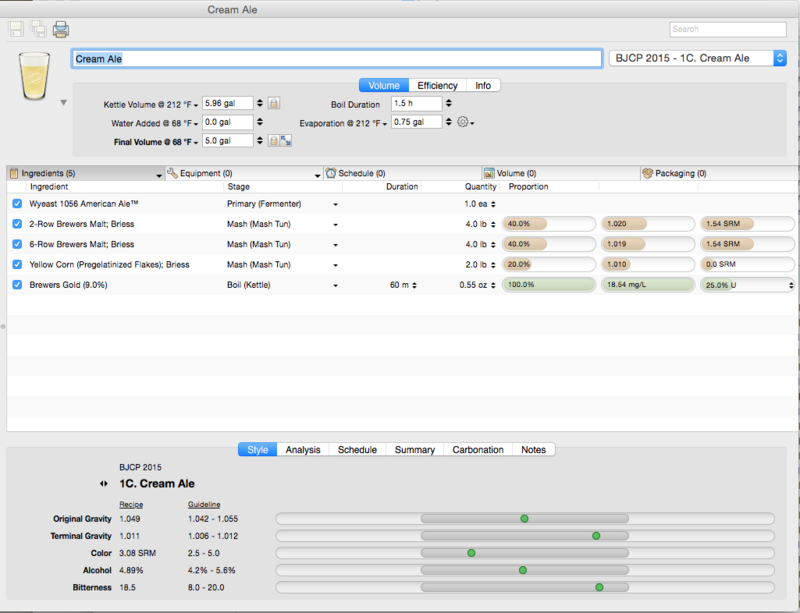 The alcoholic strength of these two styles overlaps, but cream ales are frequently slightly stronger. The grain bill is often a mix of US 6-row malt and US 2-row malt, with corn as an adjunct. The corn can be in the form of flaked maize or de-germinated corn grits, and the corn occupies up to 20% of the grain bill. In a good cream ale, you want to taste a little malt and a little corn, balanced with just enough hops to give a hint of bitterness. (The BJCP gives 8–20 of the IBU range.) The beer should be well attenuated, highly carbonated, and thirst quenching. The trick to making a great cream ale is getting enough flavor from all of the ingredients, while still ending up with a lightly flavored beer. Getting all the flavor you can from the husks involves making sure the grain bed is fully sparged. Keep sparging until the pH of the final runnings climbs to 5.8. And, taste the runnings as you go. You want to ensure that you are getting good grain flavor, but stop collecting when they get too tannic. Six-row malt is husky, so getting grain flavor from it is not difficult. You could also try adding a small amount of either Vienna or Munich malt to boost the maltiness. However, too much of either of those would probably end up being too flavorful to be representative of the style. I’d keep Vienna malt additions under 10% and Munich malt additions under 5% if you want to stay true to style. If you’re an extract brewer, doing a partial mash is virtually a must to make a good cream ale. The partial mash will give you the aroma of base malt, which is needed to make the flavor discernible. The cream ale recipe I gave earlier takes this approach. Getting good corn flavor involves either adding enough flaked maize, close to 20%, or using corn grits. If you use grits, you will have to perform a cereal mash. This is more work, but definitely brings out the corn aspect of the beer’s flavor. 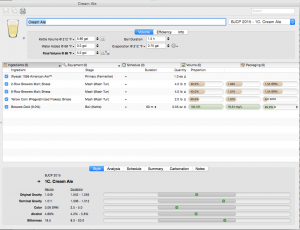 Cream ales have a low hopping rate, and generally lack late hops. As such, the variety of hops doesn’t matter much. If you hop towards the lower end of the recommended IBU range, the beer is going to taste faintly sweet, even if it’s well attenuated. Near the upper limit, the beer is well-balanced. Hops should never dominate the flavor and aroma profile of a cream ale, but they can compete with the grain flavors for an even balance. Your water is going to influence how the beer is perceived. Think of a Czech Pilsner vs. a German Pils — both are light lagers, but they are brewed with different levels of minerals. A Czech Pilsner or Bohemian Pilsner, like Pilsner Urquell, is brewed with soft water and tastes “rounded,” with the hops slightly muted. A German Pils is brewed with hard water and tastes more “minerally,” and the hops are accentuated. So, you can vary the level of calcium in your beers — from around perhaps 40 ppm minimum to up to around 200 ppm — and influence how it tastes. In either case, the level of carbonates should be low (under 50 ppm, and closer to 0 ppm would be better). However, if I were to brew a cream ale specifically to be competitive at a homebrew contest, I would try the following things. First, I would use corn grits to bring out the corn flavor. Flaked maize is very convenient, but doesn’t give quite the level of flavor that grits do. Second, I would not try to maximize attenuation. I would still mash low, and pitch an adequate amount of yeast, but I would not worry about getting the absolute lowest FG possible. In a flight of cream ales, a beer that tastes crisp and refreshing on it’s own may taste “watery” compared to other entries. I would hop near the top of the recommended range, or just over it. And finally, I’d consider using a yeast strain that leaves a small amount of esters. The clean Wyeast 1056 or White Labs WLP001 is what I’ve used in the past — and gave me the clean, dry beer I wanted. But for a contest, most beers will be brewed with that strain. Using a yeast with just a bit more character should make the beer stand out. Basically, I’d try to get the most from each of the ingredients, within the boundaries for the style. And finally, I’d carbonate the beer well. A good cream ale should be fizzy, and this seems to be difficult to achieve from many contest entrants in their bottled entries. A good, well-carbonated cream ale — with at least 2.6 volumes of carbon dioxide, or slightly higher — should stand out in a crowd. If I were brewing a cream ale for myself, I’d go with my usual recipe because I know how the beer turns out and that’s how I like it. For a contest, however, I’d brew the beer to be slightly less attenuated, “cornier,” and with a tiny bit more yeast character.